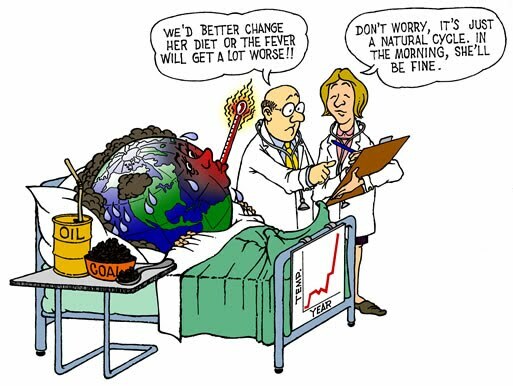 The cartoon refers to global warming­—the theory that Earth’s average temperature is gradually increasing due to the burning of fossil fuels. Fossil fuels are coal, oil, and natural gas, which are burned primarily by cars and in factories. If Earth were a patient in a hospital, and its temperature seemed to be a little high, we would want to know what would be considered a normal range of temperatures before prescribing any medication. In the same way, we would want to know how Earth’s average global temperature changed throughout its history, and why those changes occurred, before we could make good judgments about burning fossil fuels. Finding out what’s “normal” for Earth is essential before trying to decide what to do about its temperature today. To find out what is normal for a patient, the doctor would ask about the patient’s medical history. In Earth’s case we need to learn how its temperature has changed over time, and in particular how Earth’s climate and living forms have changed over time. It’s important to recognize that here we are talking about climate, not weather. Weather refers to the conditions of the atmosphere in a particular location at a given time; usually considered are the temperature, wind condition, cloud cover, and humidity or dryness. Climate refers to the average weather of a larger region, or of the entire planet, over a number of years. For example, the climate closer to the North and South Poles is generally much colder than the climate closer to the equator. While the weather may vary a great deal from day to day and season to season, the climate of an area tends to stay much the same year after year. If we look over a long enough period of time, however, we can see that climates have changed a great deal. During the last ice age, which ended over 10,000 years ago, what is now the northern part of the United States was buried under a sheet of ice over a mile thick! As you can imagine, the climate in a particular region affects the life forms that can survive there. With an understanding of the relationship between life and climate, we will be in a better position to make judgments about changes that are occurring on Earth today, and decide what to do about them. We will therefore study how life and Earth’s climate are intertwined. With knowledge of the various developments over time, we will be better able to understand and apply new information about Earth systems as that knowledge becomes available in the future. In this first chapter we will learn about the fundamental discovery that Earth has an atmosphere. Today we take this idea for granted, but 200 years ago it was a radical idea. Before we can even start thinking about life and climate, we need to learn about Earth’s atmosphere. Air is so familiar to us that we take it for granted. It’s always there and seems to go on forever. Yet, from the vantage point of a space shuttle in orbit just 300 kilometers (186 miles) above Earth’s surface, astronauts see that the atmosphere is limited. 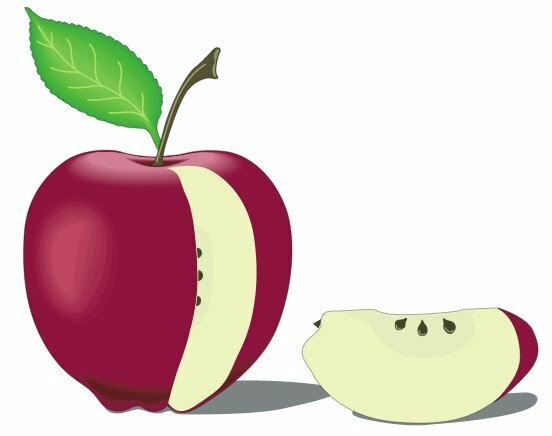 If Earth were the size of an apple, 97% of Earth’s atmosphere would be contained in a layer as thin as the apple’s skin. Years ago, the concept of air as a relatively thin layer of life-sustaining gases was difficult to accept. It seemed quite natural to believe that there was air from here to the moon and even beyond. After all, how could there be nothing? Nothing was harder to contemplate than invisible air. More than 2,000 years ago Aristotle noticed that air rushed into containers as they were emptied. His phrase “nature abhors a vacuum” was, in the early days of experimental science, accepted as fact. An engraving of Evangelista Torricelli (left) and his experiment (right). The first experimental studies of air were made by the Italian physicist Galileo Galilei. Most people know him as the first person to observe planets through a telescope. He also studied air, and in 1638 Galileo published his experiments showing that air has weight. These early experiments inspired further studies of air by Galileo’s assistant, Evangelista Torricelli, a few years later. Torricelli used glass tubes of various lengths that were closed at one end. He also experimented with different liquids. In one experiment, he completely filled a tube about a meter long with mercury—the only metal that is liquid at room temperature. Then, covering the open top of the tube with his finger, he turned the tube upside down and placed the open neck of the tube in a bowl and removed his finger. Some of the mercury flowed out of the tube into the bowl, and the level of the liquid fell. But all of the mercury did not flow out! A column of mercury remained in the tube, well above the surface of the mercury in the bowl. Torricelli found that less dense liquids formed taller columns. With a very long tube, Torricelli found that water formed a column that was 9.6 meters (32 feet) high! Mercury was the densest liquid he tried. It formed a column only 73 cm (29 inches) high. Since the glass tube did not need to be so tall, he used mercury for most of his experiments. Torricelli puzzled over why the column of liquid did not fall out of the tube. He formulated the hypothesis that the pressure of the air pushing down on the surface of the liquid in the bowl was holding the column of liquid up. In other words, air had weight. 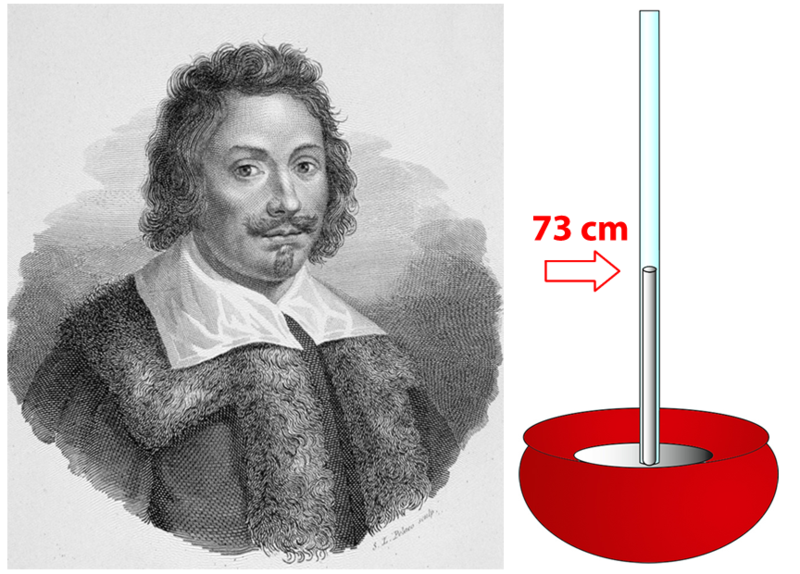 These experiments supported Torricelli’s idea that the force of air pushing down on the liquid in the bowl balanced the weight of the liquid inside the tube. However, people were not convinced that this was the correct explanation. Five years after Torricelli’s experiments, the French scientist Blaise Pascal thought of an experiment that would test Torricelli’s hypothesis about what was holding up the column of mercury. Pascal had been helping to make deep sea diving suits. He found out that as divers went deeper in the ocean, the pressure of the water increased. He thought that this pressure was caused by the weight of the water above the diver. When Pascal heard about Torricelli’s experiment, he thought that we might be like the diver—but living at the bottom of an ocean of air. At sea level we feel the pressure of the air above us. If we were to climb a mountain, the pressure should be less because there would be less air above us. For the same reason, the level of mercury in the tube should also be less. In 1648, Pascal’s brother-in-law, Florin Perier, performed the experiment. Gathering with several friends in a garden, Perier filled two glass tubes with mercury. One at a time, he held his finger over the end of the tube, turned it upside down, and placed the open end in an open bowl of mercury. In each case, the column of mercury in the tube fell to the same height. Then leaving one of the tubes and bowl with a friend who would carefully watch for any changes in the mercury level, Perier and the others took the other mercury column and bowl and rode by mule up a nearby mountain. On the summit, at about 1,000 meters (3,280 feet) Perier repeated the experiment and found that the mercury level was over 7.5 cm (3 inches) lower than it was in the garden. He did the experiment several more times on the way down, and found that the closer he came to sea level, the higher was the column of mercury. When he returned to the garden, he learned that the height of the mercury column left in the garden had not changed all day. Now both columns again were measured and found to be the same height. Pascal further experimented and found that even at the top of a tower, he could observe that the height of the column of mercury was less than it was at the base of the tower. He concluded that 1) air pressure at sea level is caused by the weight of the air above it, and 2) nature does not abhor a vacuum, since there is a vacuum (or near vacuum) inside the tube above the mercury. What do you think of these conclusions? Are they supported by the data? As a result of Torricelli’s and Pascal’s experiments scientists became aware that we live in a sea of air. In addition, a new instrument was invented: the barometer, a tube with mercury that measures air pressure. Here's an activity to help you see the power of air pressure. Pascal’s experiment illustrates several aspects of the nature of science. The first is that scientists do not work in isolation. They build on the work of others, just as Torricelli built on the work of Galileo, and Pascal built on the work of Torricelli. All of the scientists submitted their work to the critical eyes of their colleagues. Second, Pascal’s experiment illustrates that scientific conclusions must be supported by evidence. As more evidence is collected from experiments or observations, the original conclusions might be more firmly supported, or they might change. The hypothesis that Earth has an atmosphere that extends just a few miles above the surface was once an outlandish idea. The existence of the atmosphere has now been supported by so many experiments using balloons and spacecraft that today we can look back on Torricelli’s and Pascal’s experiments and credit them with the “discovery” of the atmosphere. Third, science and technology go hand in glove. The technology of deep sea diving suggested a theory of the atmosphere. The scientific experiments of Torricelli and Pascal had no immediate practical value, but eventually their discoveries and equipment contributed to the technology used today to monitor and predict the weather. For example, a scale was added to Torricelli’s glass tube, resulting in an instrument called a mercury barometer that measures daily changes in air pressure. As huge waves of air raise or lower the amount of air above us, the amount of mercury in the glass tube rises and falls. Scientists have agreed to call 29.92 inches (76.0 cm) of mercury “standard atmospheric pressure at sea level.” Weather reports on television refer to “high” and “low” pressure areas where the mercury level is above or below standard atmospheric pressure. Finally, Pascal’s insistence that one column of mercury be left at the base of the mountain while the other is carried to the top of the mountain is the first clear example of a “scientific control” that was used to test a scientific theory. Given what you know about how atmospheric pressure in a particular place changes from day to day, why do you think that this part of the experiment was important? As the idea that the planets orbit the Sun was accepted, the concept of a limit to the atmosphere became more understandable. First, if air existed between the planets and the Sun, the resistance of the air would have long ago slowed the planets down and they would have fallen into the Sun. The fact that they did not change the speed of their revolutions suggested that air did not exist in space. And, as Pascal’s experiment confirmed, the layer of air got thinner and thinner the further the distance from Earth’s surface. It was reasonable to assume that at a certain distance the amount of air became negligible. The atmosphere is compressed by its own weight so that there is more of it at the bottom than at the top. Any measurement of the height of the atmosphere, therefore, depends on how much of the atmosphere you want to include. Half the mass of Earth’s atmosphere lies below about 5.5 kilometers (3.4 miles). 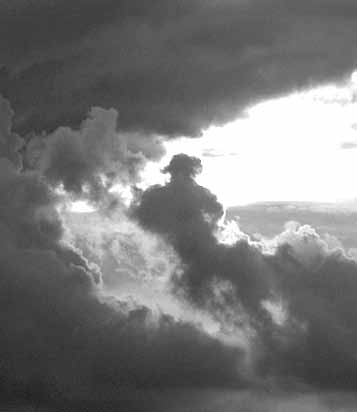 The lowest 18 kilometers (11 miles), where most weather phenomena occur is called the troposphere. It contains about 75% of the mass of the atmosphere. The next layer, called the stratosphere, extends 50 kilometers (30 miles) above Earth. These two layers contain 99% of the mass of the atmosphere. The mesosphere is the area of the atmosphere from 50—80 km (30—50 miles) above the surface of Earth, and is the coldest, with an average temperature of -90°C (-130°F)! The largest portion of the atmosphere is called the thermosphere and exists from 80—480 km (50—300 miles) above Earth’s surface. This upper part of the atmosphere is the transition zone into space. Where did our atmosphere come from? That was an unanswerable question until only a few decades ago. That’s the question we’ll consider in the next chapter. Make a scale drawing to represent Earth's interior, its surface, and its atmosphere. This book is about Earth’s features and how changing physical conditions may have led to the evolution of life and to the relatively comfortable world we know today. As you read this book you may ask yourself two important questions: "Why should I care about Earth’s early history?" and "How could anyone possibly know what conditions were like billions of years ago?" The answer to the first question is that we live at a time when there is a great deal of controversy about how humans are affecting the environment. The changes that are being discussed go far beyond littering the streets (which we shouldn’t do) or even polluting the air and water. It is possible that humans are changing the climate in ways that may last for centuries and that may affect the world of our children and grandchildren. In order to understand the changes that we observe today, we need to know how our planet changed in the past. As for how anyone could possibly know what things were like billions of years ago, the authors encourage you to be skeptical. We will describe the evidence from fossils, the important theories and experiments, and the history of key scientific ideas in this field. But the history of climate and life is still only partly understood, and new discoveries are certain to be made as you read this book! You are encouraged to ask questions, and search the Web for some of the latest discoveries.